Since time immemorial, bulls have been a totemic animal, a creature representing the qualities of the gods - strength, bravery and nobility. For this reason, Man in his desire to be on the same level as the gods, has been challenging the bull for millenniums, from Greece through Anatolia to Crete. Therefore, the bull running in Pamplona is nothing more than a modern display of this challenge; the local way of defying death which the bull potentially brings with it. The present-day fighting bull, which Ortega y Gasset defined as “the professional of fury”, is the product of the historical evolution of the Bos Primigenius, which inhabited the land in the quaternary period and which subsequently gave rise to the Aurochs or Urus bulls, the last example of which died in Poland in the 15th century. Nowadays, fighting bulls are raised on large plains in Andalusia, Extremadura and Salamanca, although there are also herds in Madrid, Navarre, La Rioja and Aragon. It is calculated that one and a half hectares of land are required for each bull raised and that each adult bull consumes 60 kilos of grass or 15 kilos of hay. For this reason, the bulls spend the first four years of their life in extensive pasturelands in which they only see men at a distance and almost always on horseback. It is therefore easy to imagine the stress experienced when transported to Pamplona in narrow lorries and released into the streets with hundreds of people running alongside them in an explosion of colours, movements, noise and stimuli which they have never seen before. Given the city's liking for big bulls (25% of those running in Pamplona weigh more than 600 kilos, with quite a few at 700 kilos) the bulls are chosen for size, good physical appearance, pointed horns, and seriousness, from the best and most acclaimed herds in Spain, such as: Miura, Cebada Gago, Jandilla, Conde de la Corte, Guardiola, Marqués de Domecq, Pablo Romero, Dolores Aguirre, etc., names which appear in the Pamplona bullfight programs, year after year. Bulls, despite their clumsy appearance, are strong, agile creatures, capable of jumping considerable heights, and are also quick-moving, far quicker than Man, and seven times heavier. For this reason, theoretically, Man has a very low chance of winning this "battle" against the bull, in the bull running. 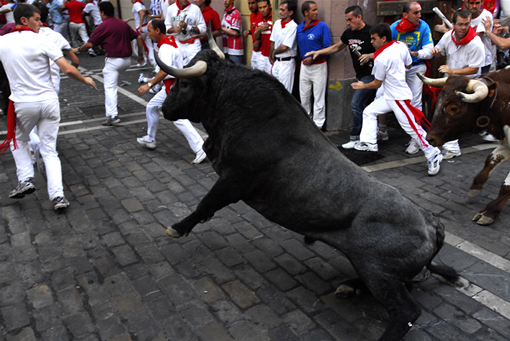 Despite this, in 95% of the cases, runners in Pamplona come out victorious and unharmed.